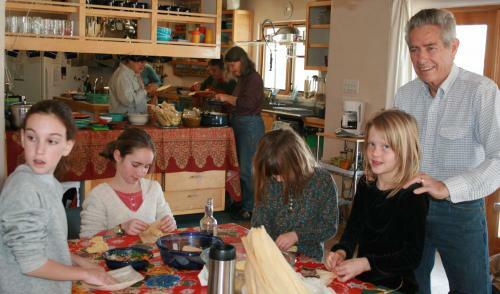 The Commons on the Alameda is a pueblo-style cohousing community on 4.5 acres at the edge of the city of Santa Fe. Construction began in 1991 and the last homes were completed in 1997. Our common house is adjacent to our main plaza. Our 28 homes cluster around four beautifully landscaped smaller courtyards that we call "placitas". We eat communal organic meals on Mondays and Thursdays using local and organic produce as much as possible. Residents participate in the cooking and cleaning up for one meal per month; the remainder of their eight hour per month service commitment involves various endeavors including landscape maintenance, newsletter production, and childcare. Committee chairs (kitchen, guest room, grounds, etc) orchestrate much of the nitty-gritty. We have two community meetings per month--one to discuss and make consensus-based decisions regarding business items and the other to share on a more personal level. Every fall we host our community celebration for the greater community with tree planting, cider making, entertainment, green chili stew, and dancing. We have an orchard area with a chicken coop, fire circle, and a basketball hoop. Several residents have home businesses. Many of our homeowners have rental rooms or efficiency units available. The community has three rooms available for guests of residents. We have about eighty residents, with approximately 25% of residents being children. The community remains focused on youngsters with cooperative childcare that provides childcare for meeting times and other community events. There are also play areas throughout the property.